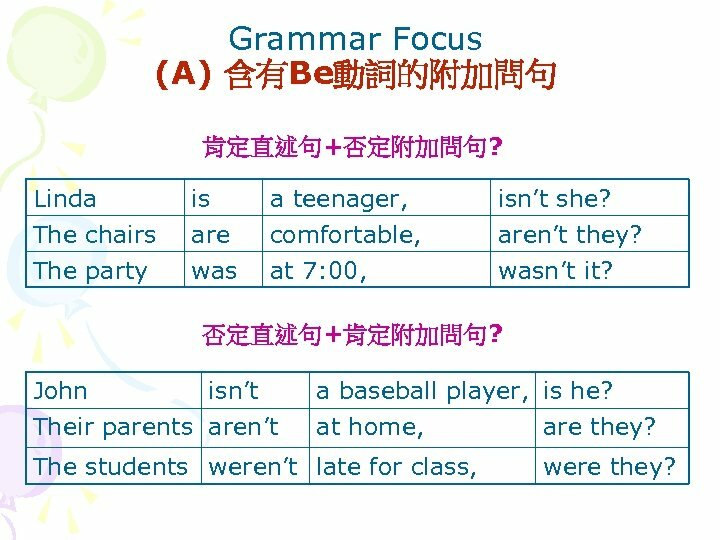 Grammar Focus (A) 含有Be動詞的附加問句 肯定直述句+否定附加問句? Linda The chairs The party is are was a teenager, comfortable, at 7: 00, isn’t she? aren’t they? wasn’t it? 否定直述句+肯定附加問句? John isn’t Their parents aren’t a baseball player, is he? at home, are they? The students weren’t late for class, were they? 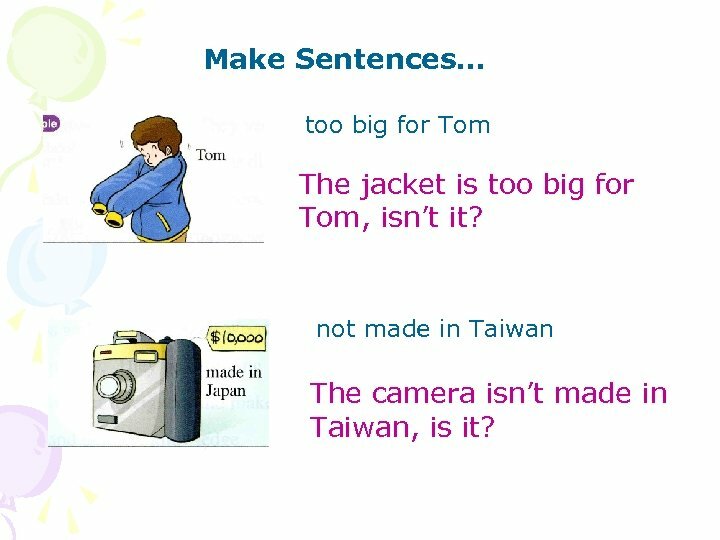 Make Sentences… too big for Tom The jacket is too big for Tom, isn’t it? not made in Taiwan The camera isn’t made in Taiwan, is it? 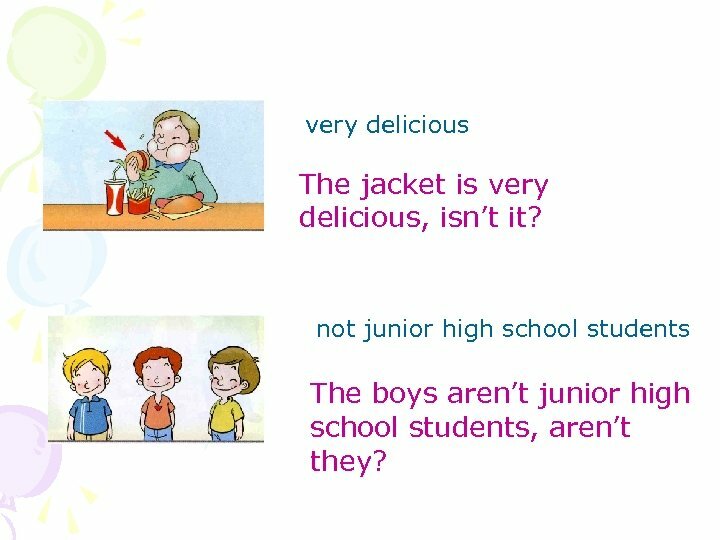 very delicious The jacket is very delicious, isn’t it? not junior high school students The boys aren’t junior high school students, aren’t they? late for work / yesterday He was late for work yesterday, wasn’t he? not cold / last Sunday It wasn’t cold last Sunday, was it? 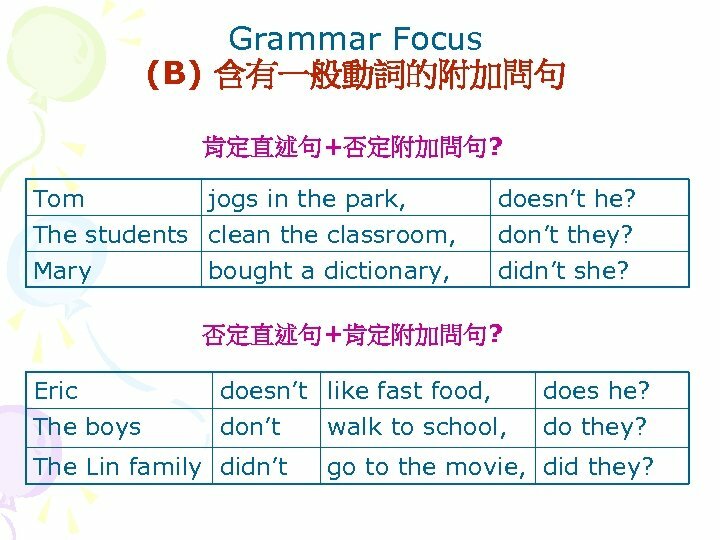 Grammar Focus (B) 含有一般動詞的附加問句 肯定直述句+否定附加問句? Tom jogs in the park, The students clean the classroom, Mary bought a dictionary, doesn’t he? don’t they? didn’t she? 否定直述句+肯定附加問句? Eric The boys doesn’t like fast food, don’t walk to school, The Lin family didn’t does he? do they? go to the movie, did they? 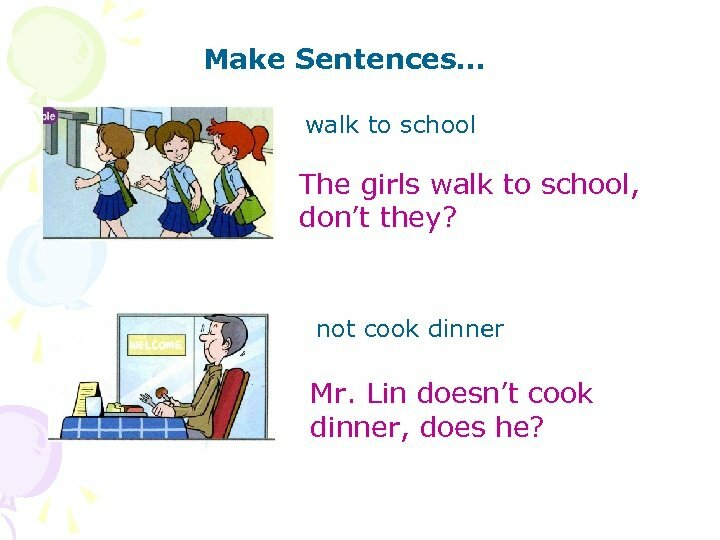 Make Sentences… walk to school The girls walk to school, don’t they? not cook dinner Mr. Lin doesn’t cook dinner, does he? have a beautiful garden Aunt Annie has a beautiful garden, doesn’t she? 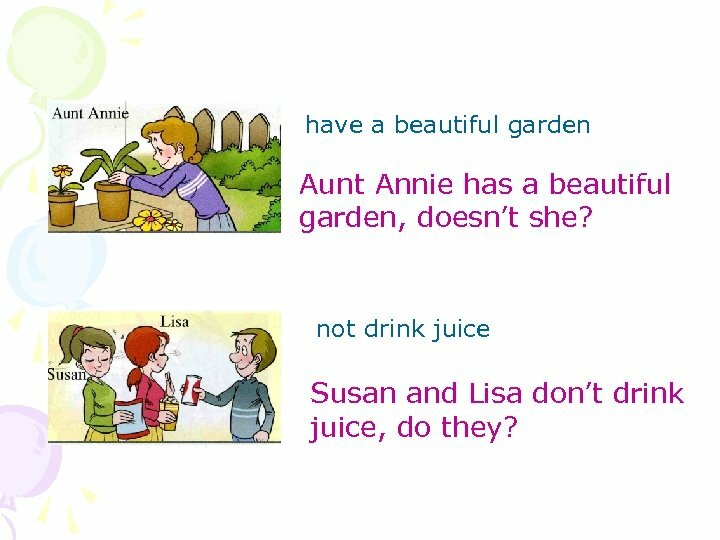 not drink juice Susan and Lisa don’t drink juice, do they? 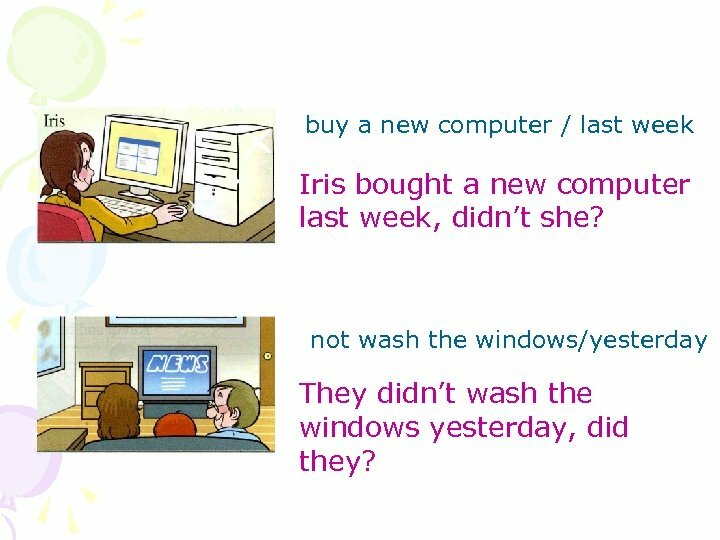 buy a new computer / last week Iris bought a new computer last week, didn’t she? not wash the windows/yesterday They didn’t wash the windows yesterday, did they? 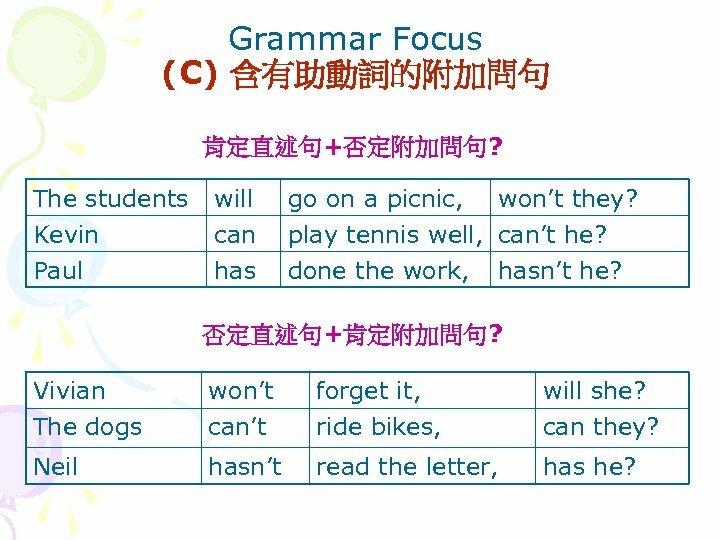 Grammar Focus (C) 含有助動詞的附加問句 肯定直述句+否定附加問句? The students Kevin Paul will can has go on a picnic, won’t they? play tennis well, can’t he? done the work, hasn’t he? 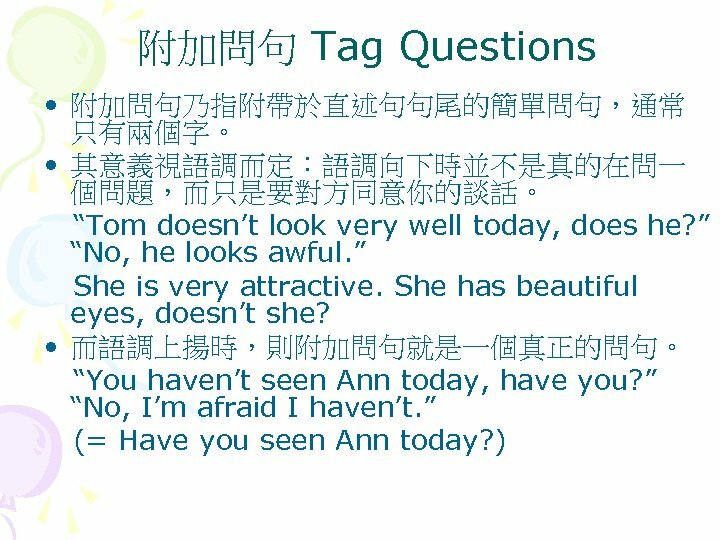 否定直述句+肯定附加問句? Vivian The dogs won’t can’t forget it, ride bikes, will she? can they? Neil hasn’t read the letter, has he? 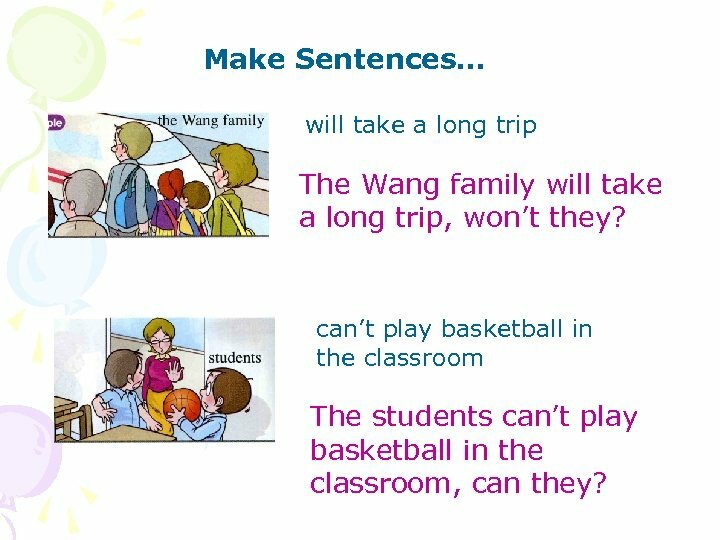 Make Sentences… will take a long trip The Wang family will take a long trip, won’t they? can’t play basketball in the classroom The students can’t play basketball in the classroom, can they? will have a birthday party The children will have a birthday party, won’t they? 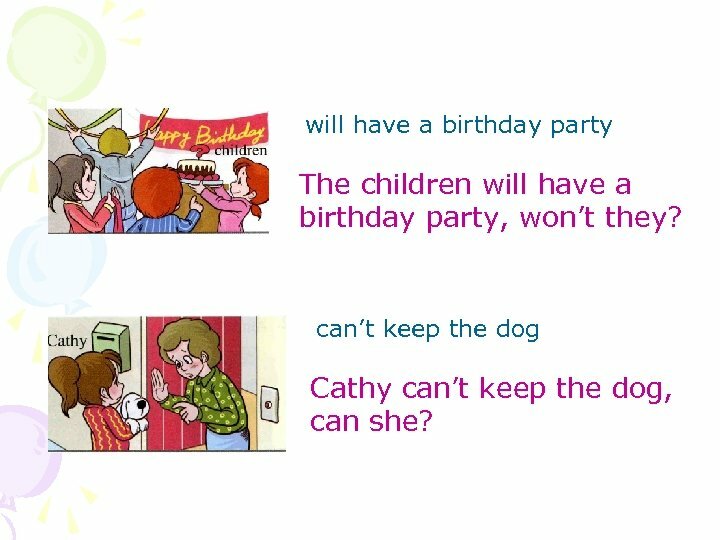 can’t keep the dog Cathy can’t keep the dog, can she? have had dinner Kevin and his family have had dinner, haven’t they? 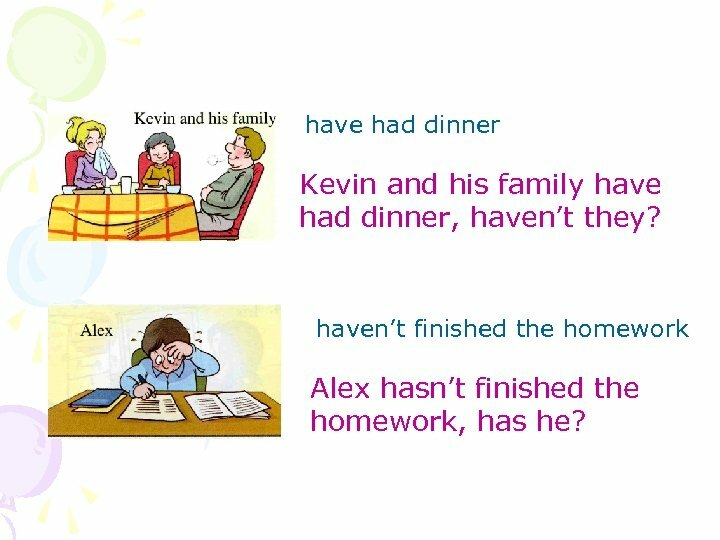 haven’t finished the homework Alex hasn’t finished the homework, has he? 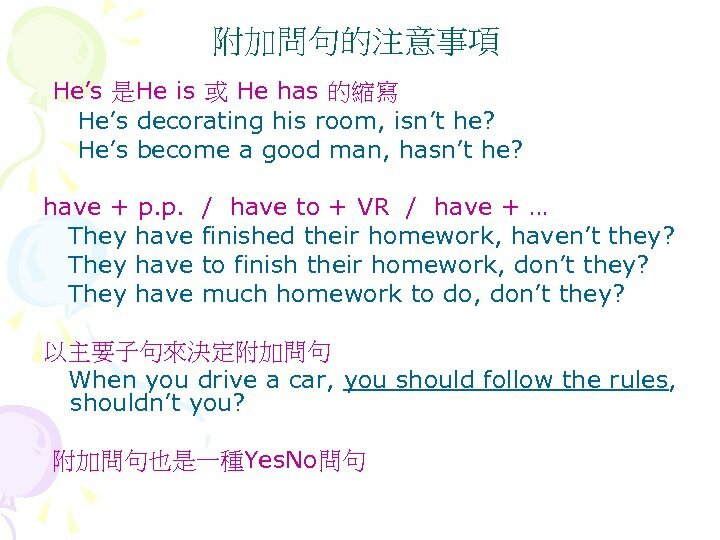 祈使句的附加問句 (a)肯定或否定的祈使句, will you? Please come in, will you? Don’t stand over there, will you? (b)邀請對方吃東西, won’t you? 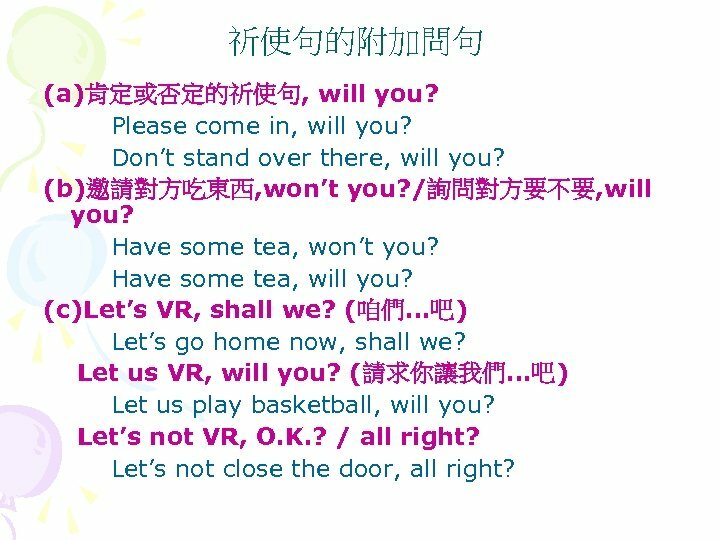 /詢問對方要不要, will you? Have some tea, won’t you? Have some tea, will you? (c)Let’s VR, shall we? (咱們…吧) Let’s go home now, shall we? Let us VR, will you? 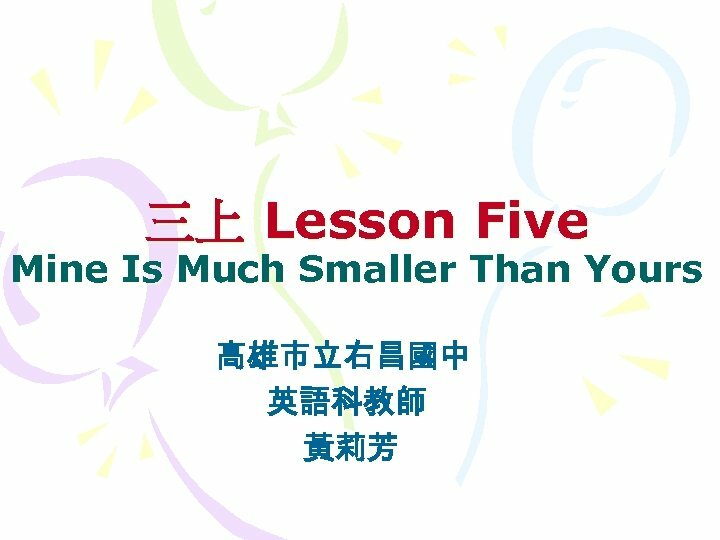 (請求你讓我們…吧) Let us play basketball, will you? Let’s not VR, O. K. ? / all right? Let’s not close the door, all right? 附加問句的注意事項 I am happy, am I not? 或 aren’t I? 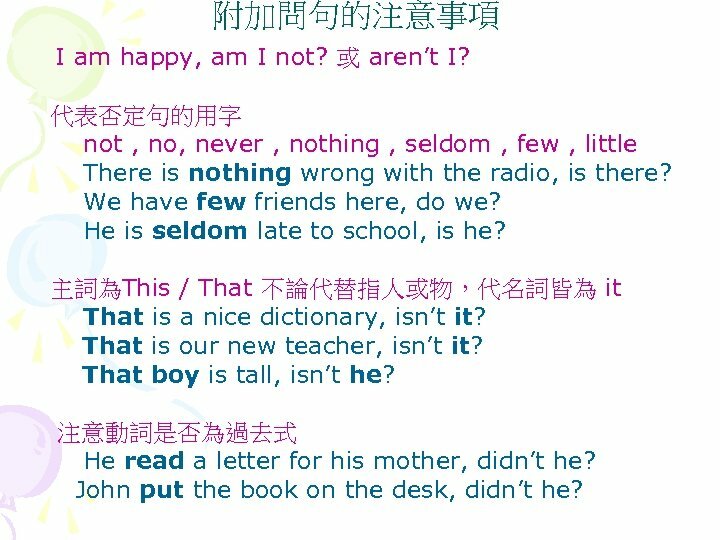 代表否定句的用字 not , no, never , nothing , seldom , few , little There is nothing wrong with the radio, is there? We have few friends here, do we? 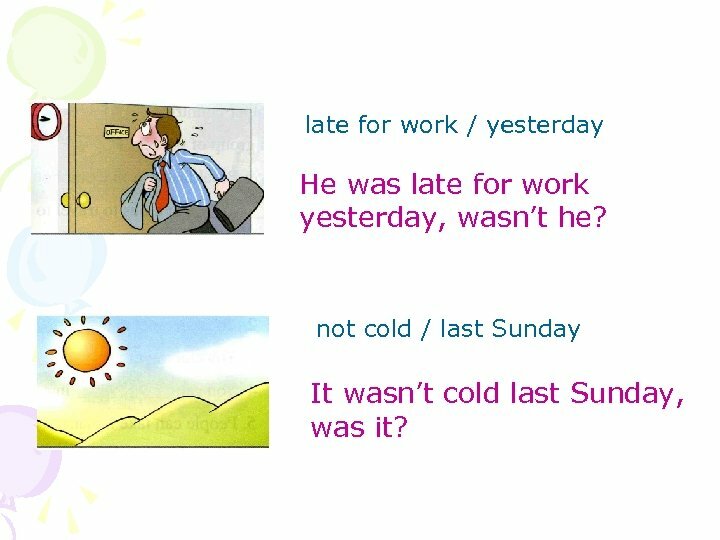 He is seldom late to school, is he? 主詞為This / That 不論代替指人或物，代名詞皆為 it That is a nice dictionary, isn’t it? That is our new teacher, isn’t it? That boy is tall, isn’t he? 注意動詞是否為過去式 He read a letter for his mother, didn’t he? John put the book on the desk, didn’t he?